Department of Chemistry and Biosciences, SASTRA Deemed University, Srinivasa Ramanujan Centre, Kumbakonam, Tamil Nadu, INDIA. Department of Botany, Bishop Heber College,Thiruchirappalli,Tamil Nadu, INDIA. Department of Human Genetics and Molecular Biology, Bharathiar University, Coimbatore,Tamil Nadu, INDIA. Tridax procumbens comes under the family Asteraceae Tridax which is found to have anti-inflammatory, analgesic properties. The morphological parameters such as the body weight, liver and kidney weight of experimental animals which were fed by alfatoxin and thereby treating with extracts of T. procumbens were studied along with the Hematological parameters such as Haemoglobin (Hb), Red Blood Corpus Cells (RBC), White Blood Corpus Cells (WBC), Packed Cell Volume (PCV) and Prothrombin time (PT). The results of this study shows that there is an significant changes in the body weight liver and kidney weight in T. procumbens treated animals and also significant raise in blood level was seen in the T. procumbens treated animals. Based on the results obtained, we concluded that T. procumbens have an antiaflatoxicosis potency. In the system of Ayurveda medicine, the herbal plants and their extracts are used in the treatment of certain diseases. T. procumbens is the species of Tridax family which is found to have anti-inflammatory and analgesic properties.1,2,3This plant and its extracts are commonly used in Ayurvedic medicine as anticoagulant, hair tonic, antifungal and insect repellent to treat bronchial catarrh, diarrhoea, dysentery, and in wound healing process.The objective of the study is to find out the changes in organ (Liver and Kidney) and body weight of the experimental animals on treating them with extracts of T. procumbens in alfatoxin fed experimental animals. The experimental rats were treated with aflatoxin along with tannin and sylimarin. These experimental animals showed changes in morphology parameters. The hematological parameters were also recorded along with the above mentioned morphological changes in those experimental rats. Male albino wister rats weighing about 125 to 150 g (45-60 days old) were purchased from Tamilnadu Veterinary University, Madhavaram, Chennai and maintained under standard experimental conditions (Temperature 27º±2º C, relative humidity 60±5% and 12 h light/dark cycle) in the animal house of Periyar Maniyammai College of Pharmaceutical Sciences, Tiruchirapalli. They were fed with pelleted diet manufactured by M/s Hindustan Foods Limited, Bangalore, India and had free access to water ad libitum. Before the commencement of actual experiment the rats were acclimatized in the above condition for 15 days. 50 g of raw rice was taken in 250 ml conical flasks. After adding 25ml of water, the mixture was allowed to stand for 2hours with frequent shaking. The flasks were autoclaved at 15 psi. for 15 min, cooled and inoculated with spores of A. parasiticus ‘NRRL-2000’. The flasks were kept at room temperature in slanting position in a dark humid place and vigorously hand shaken six to ten times a day to avoid clumping. After 10 days of post-inoculation, the contaminated rice was treated in a steam bath for 5 min to arrest further growth of fungus and aflatoxin production. The rice was dried overnight at 60°C in a hot air oven. The mouldy rice was powdered and the quantity of aflatoxin content was estimated. Quantitative measurement of aflatoxin B1 in mouldy rice was done as per the method of Romer.5 Slurry was prepared by blending 50 gm of mouldy rice powder with 250 ml of water. The extraction was done by blending 150 gm of slurry with 250 ml of acetone for two min and filtered through Whatman No.1 filter paper. The extract was purified by taking 150 ml of the extract in 500 ml of conical flask and swirling it after adding 3 g of cupric carbonate. In another 500 ml conical flask ferric gel was prepared by adding 30 ml of ferric chloride solution (0.41M) to 170 ml of sodium hydroxide (0.2M) and swirled. The ferric gel was immediately transferred to the flask containing the extract and the contents were mixed thoroughly and was allowed to stand for 2 min. It was filtered through Whatman No.1 filter paper and 100 ml of filtrate was mixed with 100 ml of 0.03% sulphuric acid in 500 ml separating funnel and the extraction was done thrice using 20 ml, 20 ml and 1 0ml of chloroform respectively and each time the lower chloroform layer was collected. The combined extract was transferred to a 250 ml separating funnel containing a mixture of 100 ml of 0.02 M potassium hydroxide,1% potassium chloride mixture and gently swirled for 10 sec. The lower chloroform layer was collected in a 100 ml beaker through a funnel containing a bed of anhydrous sodium sulphate. The final extract was evaporated to near dryness in a water bath at 40°C and transferred to a vial and dried completely. Known quantity of chloroform was added to dilute the extract and subjected to thin layer chromatograph (TLC) for quantification. The TLC plates were prepared (0.25 mm thickness) by using silica gel G: water (2:1) slurry and activated at 110°C for an h. Pure aflatoxin B1 obtained from MLS Sigma chemicals, USA, was used as the standard. The samples and standards were spotted on the TLC plates and developed in Chloroform:Acetone (9:1) mixture for 45 min. The developed plates were compared under long wave UV lamp in a chromato view cabinet. The aflatoxin B1 content was calculated according to AOAC (1990) specification. It is clear that for short duration single administration studies, higher dosages are used. For prolonged administration (30 days) the concentration of toxin is low. Hence for the present study of 30 days duration, 1ppm concentration of the toxin along with the diet has been fixed. All biochemicals were obtained from Sigma Chemical company, Sisco Research Laboratories, Mumbai, India, Boehringer-Mannheim, Germany and British Drug House (BDH), Pvt. Ltd., Glaxo division, Mumbai, India. All chemicals, acids, bases, solvents and salts used for the investigations were of Analytical grade (AR). 60 rats of same age and equal weight were selected after 15 days of acclimatization, they were divided into 10 groups 6 each the animals were fed ad libitum with the respective experimental feed and water through at experimental period. All the managemental practices were followed to all animals identically except the feed and oral treatment. Group I : Feed alone. Group II : Feed + Aflatoxin (1ppm). Group III : Feed + T. procumbens (1%). Group IV : Feed + Aflatoxin (1ppm) + T. procumbens (1%). Group V : Feed + Alcoholic extract of T. procumbens (250 mg/kg body weight). Group VI : Feed + Aflatoxin (1 ppm)+ Alcoholic extract of T. procumbens (250 mg/kg body weight). Group VII : Feed+ Tannin (100 mg/kg body weight). Group VIII : Feed+ Aflatoxin (1 ppm)+ Tannin (100 mg/kg body weight). Group IX : Feed + Sylimarin (100 mg/kg body weight). Group X : Feed+ Aflatoxin (1 ppm)+ Sylimarin (100 mg/kg body weight). Body weights of individual animals were recorded before and after the experimental period. Six rats from each treatment group were killed after 30 days along with their control group. The animals were fasted overnight, sacrificed by cervical decapitation. Liver and kidney were immediately excised; after perfusing with physiological saline, the organs were blotted dried, weighed in the electronic balance (Anamed Model 3000). The morphological parameters were observed, which includes body weight, liver weight and kidney weight of the alfatoxin fed animals. The whole blood was collected in EDTA (anticoagulant) for haematological experiments and the serum was obtained from the clotted blood samples for biochemical studies. The hematological parameters such as Haemoglobin (Hb),10 Red Blood Corpus Cells (RBC),11 White Blood Corpus Cells (WBC),12 Packed Cell Volume (PCV),13 Prothrombin time (PT)14 were recorded eventually. In the present investigation, since more than two treatment groups (ten treatment groups) have been studied, the analysis of variance (ANOVA) was carried out to test whether changes among the groups differ significantly. Single way of analysis of variance was used to examine if significant differences existed in the haematological, biochemical changes among the different groups. A planned comparison among the means was done and the variance ratio was obtained. The entire analyses were computed with the help of SPSS Software package (12 version). The liver and kidney body weight changes in both control and experimental animals is shown in. Figure 1a-c. The body weight of the rats which declined due to the aflatoxin, recovered after treatment with each one of the drugs [T. procumbens (T4), its alcoholic extract (T6) and tannin (T8)]. The maximum recovery was found in sylimarin treated group while the minimum recovery was found in tannin. Entire plant and alcoholic extracts are equally more efficient than the individual single compound, tannin of the leaf. The control animals did not show any significant variation in the body and organ weights when compare to the drug treated animals [T. procumbens (T3), alcoholic extract (T5), tannin (T7) and sylimarian (T9)]. But among the drug treated animals, entire plant (T3) induces maximum increase in the body weight and tannin the minimum weight (T7). Changes in the Body weight of the experimental rats. Changes in the Liver weight of the experimental rats. Changes in the Kidney weight of the experimental rats. Moreover the host responds to increased tumour load by decreased muscle protein synthesis and muscle break down. Amino acids resulting from breakdown are subsequently used by liver, further increasing the host metabolic burden.17 This could probably be the reason for the loss of weight due to aflatoxicosis. In aflatoxicosis condition, the weight of liver and kidney (not significant) decrease largely due to protein degradation during tumour growth. Protein metabolic perturbations in host, although causing tissue waste may themselves favour the growth of tumour itself. Table 1 shows the levels of haemoglobin, RBC, WBC, PT and PCV in the control and experimental groups of rats. Increased RBC and WBC counts and increased levels of haemoglobin and PCV, in the T. procumbens, its extract and tannin treated groups, indicate the protective effects of the plant and its extract on the haemopoietic system. Tannin induces the maximum recovery in all the haematological parameters (Haemoglobin, RBC, WBC, Prothrombin and PCV). Alcoholic extract brings about the maximum recovery except in haemoglobin. The proven hepatoprotective agent (sylimarin) was next in its recovery efficiency in all the haematological parameters studied. The blood cells are the mobile units of the body’s protective system.19 Decreased white blood count (p<0.001) in the aflatoxin fed animals indicate decreased resistance of the body to toxicity induced by AFB1. Decreased RBC count (p<0.001), haemoglobin (p<0.001) and PCV (p<0.001) also indicate the severity of hepatic damage induced by AFB1. Decrease in the haemoglobin levels might be due to increased catabolism and degradation of haemoglobin to bilirubin. Reduction in Hb content can be related to decrease in RBC number which in turn indicates anaemic induction.20 Induction of anaemic status in toxicity and cancer are well established. A mild degree of anaemia is one of the complications observed in HCC patients.21 Increased RBC and WBC contents and increase levels of haemoglobin and PCV in the drug treated groups along with the toxin indicate the protective effect of the plant and its extract on the haemopoietic system. Levels of Haemoglobin, RBC Count, WBC count, PCV and Prothrombin Time in the control and experimental groups. The PT was significantly (p<0.001) decreased in the T. procumbens, its alcoholic extract and tannin treated group of rats as compared to aflatoxin fed group of rats. This indicates the ability of plant and its extract to correct the defects in the intrinsic and extrinsic pathways of the coagulation system. From the above observations, it can be concluded that the organ and body weight of the animal declined due to the aflatoxin and it increased on treatment with of T. procumbens in the extracts of aqueous, alcoholic extracts. 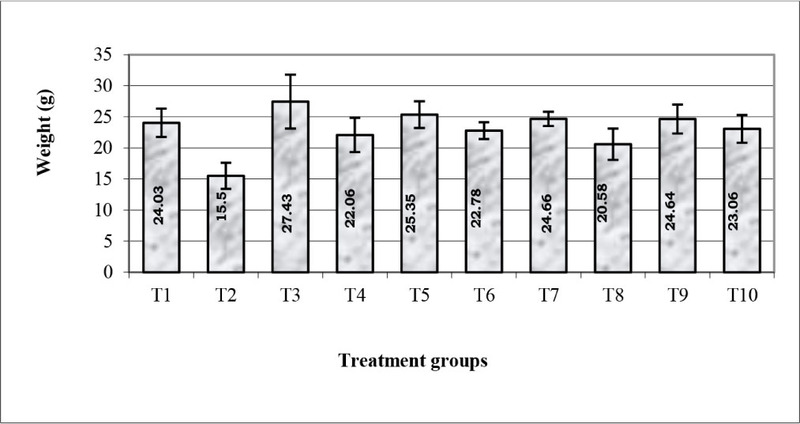 The recovery of body weight on treating with T. procumbens is due to its antiaflatoxicosis potency.The RBC, WBC counts, haemoglobin levels and PCV were observed to increase in T. procumbens, its extract and tannin treated groups whereas the PT has been found be decreased in T. procumbens, its extract and tannin treated groups when compared to aflatoxin fed group of experimental animals. Leaf extracts of Tridax procumbens were taken, combined with aflatoxin and then fed to experimental animals to study the Hematological parameters such as Hemoglobin, Red Blood Corpus Cells, White Blood Corpus Cells, Packed Cell Volume and Prothrombin time. The Red Blood Corpus Cells, White Blood Corpus Cells count, Haemoglobin levels and Packed Cell Volume were observed to increase in T. procumbens, its extract and PT has been found be decreased. From the above results, we concluded that T. procumbens have an anti-aflatoxicosis potency. The Authors thank the Head, Department of Botany, Bishop Heber College, Tiruchirappalli for providing the facilities. Palanisamy Sampathkumar: Department of Chemistry and Biosciences, SASTRA Deemed University, SRC campus, Kumbakonam, Tamil Nadu, INDIA. His area of research includes Clinical Biochemistry and Phytopharmocology.